There are various Forex order types available to you when trading. In this tutorial, I will explain what they are and provide you with examples of when you might use them. Keep reading to learn more because they can help you with entries and exits without having to be present at your trading platform to execute the deals. The different types of orders that you can use when trading are usually categorized as either market execution orders or pending orders. Market execution orders are order types to buy or sell at the current market price. These Forex order types can be executed quickly from a double or single click on the trading panel. This type of order can be used when you just want to get in and out of the market quickly and on the spot. These Forex order types are the most basic types of orders when trading and don't need much elaboration. They are straight forward orders to buy or sell now. A pending order is a Forex order type to buy or sell at a predefined price. This Forex order type is placed either above or below the current market price and it will get triggered when the price reaches it. Once the predetermined price is reached to trigger the pending order, they become market execution orders. Pending orders are orders sit on the Forex broker’s trade server waiting to be executed. Pending orders also have several variations and which one to use will depend on what you trading strategy or tactics are. 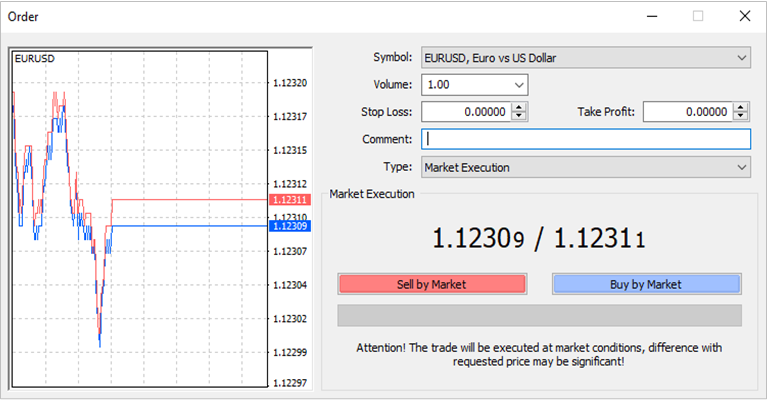 To create a pending order on the MT4 platform, just click the new order button at the top left hand side of the platform. Another window will appear allowing you to select the Forex order type. The main advantages of using pending orders when trading is that you can place them in advance to enter or exit the market should a particular price action event occur. This allows you to trade without being present at your trading platform. For example, you can place pending orders at prices that would suggest the completion of a specific chart or price pattern. You may not know when the pattern will complete but if it does, you can participate in the potential move. Most trading strategies involve entering the market and opening trades when prices break out of a range or when they bounce at a price ranges boundary. Depending on what you think the price will do, break out or bounce, you can place the appropriate Forex order type to take advantage of it. Let’s look at these different pending order types and when you might want to use them. A buy stop order is a pending order to buy above the current market price. You can place this Forex order type ahead of time to buy at a predefined price if the market trades there. Once you have identified a price range, you could place a buy stop pending order just above the boundaries of the price range. Prices are seldom contained within a range for long without them breaking out of either side. These break outs can potentially mark the beginning of a bullish or bearish price trend if they follow through. Traders usually use this order type to trade beak out strategies to the upside. A buy limit order is a pending order to buy below the current market price. Traders usually use this order type when they anticipate a drop in price and then a bounce higher. You could place this order type at the lower boundary of a price range or anywhere below the current market price. If the price trades down to it, your buy limit order will be triggered and executed to open a long position in the market. By placing this order type you can execute a long position at more favorable prices and you don’t have to be present at your trading platform to trade. The above image illustrates two examples of when you might want to use a buy stop vs a buy limit order to execute deals that will give you a long position in the market. A sell stop order is like the buy stop order but inverted. It is another pending order but this one will execute a sell order below the current market price. This is a Forex order type you can use to trade bearish break outs from the lower boundaries of a price range. You could also use this order in conjunction with the buy stop pending order. By placing one of each order at either side of a price range, you could participate in any potential move whichever way the price breaks out. A sell limit order is a pending order that you can place above the current market price to open a short position in the market. Like the buy limit order, this Forex order type can be used around the upper boundaries of price ranges whenever you anticipate price to bounce and then resume to trade lower. The same advantages apply, you don’t have to be present at your trading platform to execute the deal. The image above shows two examples of when you might want to use a sell stop vs a sell limit order to execute short positions in the market. A stop loss order is a very important order type when trading Forex. This order type is an order associated with open deals. Its primary purpose is to stop further losses if the price adversely moves against you by a predetermined number of pips or dollar amount. You should use this Forex order type with all of your deals to help you manage and limit risk when trading. By determining a stop loss before executing a deal, you will be able to calculate what your maximum risk will be and trade an appropriate lot size to not exceed it. Trading without a predefined stop loss is risky. A stop loss should be calculated and placed at the earliest price that would suggest that your trade idea has been invalidated. Naturally, it would be placed at a price below the current market price for long deals and above the current market price for short deals. You can also use this order type to protect your profits on winning deals. As the price starts moving in your favor, you can modify the stop loss in such a way that your risk is being reduced. Then by modifying the stop loss and placing it at a better price than your entry price, you can lock in some profits. So even if the price starts moving against you, the deal will be stopped out at a profit. A stop loss is a just another pending order which reverses the original transaction. So if you are long a currency pair, your stop loss will act as a sell stop for your open deal to buy the other currency. Vice versa for short positions, the stop loss will act as a buy stop when it is triggered. You do not have to place a separate pending order as a stop loss. A stop loss can be entered at the time when you open a deal or by modifying the deal once it is open. To do this on the MT4 platform, you can simply right click on any open deal in the trade terminal at the bottom of the trading platform. Then select modify or delete order from the pop up menu that appears. Another window will then appear that will allow you to make modifications to the deal. Most trading platforms operate in similar ways. A trailing stop loss order works in the same way as a stop loss order, except it adjusts itself and gets modified automatically as the market prices moves in the direction of your deal. As the name suggests, this Forex order type trails the current market price by a predefined number of pips or points. For example, you can set a trailing stop loss of 50 pips. When your deal reaches 50 pips in profit, the stop loss will be adjusted and modified to remain 50 pips away. Trailing stop losses only move in one direction and that is in the direction of your trade. If the market price retraces and starts to adversely move against your deal, the trailing stop loss will remain in its last modified position and your deal will close once it gets triggered. This is an order type and tool to help you reduce your risk and potentially lock in profits as the price keeps moving in your favor. The advantage of using this type of order is that it allows you to let profitable trades run. It can potentially work well in trending markets. The disadvantage of using this Forex order type is that you might get stopped out of your deals prematurely. As the price retraces, it is possible to get stopped out just before it turns and resumes the original trend. Some traders prefer to manually trail a stop loss after the price puts in a relative high or low, in anticipation that it will resume its original trend. This provides more control because you can make adjustments based on the underlying price structure of the market instead of doing it by fixed number of pips. The MT4 and MT5 platforms have a client side trailing stop loss. This means that your computer and trading platform must remain on and open for it to function. The cTrader platform has a server side trailing stop loss. This means that it will function even when you close the trading platform or turn off your computer. The instruction to adjust and modify the trailing stop loss is handled by the trade server as opposed to the client terminal. You can set a trailing stop loss in a similar way as illustrated above for modifying open orders. This can be done by right clicking the open deal record in the trade terminal and then selecting trailing stop from the pop up menu that appears. A take profit order is a pending order to take profits at a predefined price objective. As the name suggests, this Forex order type is associated with a Forex deal and is the inverse order type of the stop loss. Take profit orders should be set at the price objectives you are aiming for. So for long positions, a take profit order will be set above the current market price. For short positions, it will be set below the current market price. Both take profit orders and stop loss orders are orders to exit the market. You can modify a take profit order in the same way as previously explained and shown in the image above. The advantage of using this Forex order type is that you can close your deals and take profits without being present at your trading platform. You may not know when your price objective will be reached but a take profit order will allow you to close the deal in profit if or when it does reach it. Like the stop loss order, you should calculate and determine your potential profit objective before opening a deal. When you do both, calculate risk and potential profit, you can determine the risk vs potential reward. This will enable you to better assess whether it is worth taking a trade opportunity or not. I will cover this in more detail in later tutorials. Irrespective of the Forex order type used to execute a Forex deal, you can close them at any time. Market orders allow you to buy or sell a currency pair at the current market price. Buy stops are pending orders above the current market price to go long a currency pair. Buy limits are pending orders below the current market price to go long a currency pair. Sell stops are pending orders below the current market price to go short a currency pair. Sell limits are pending orders above the current market price to go short a currency pair. A stop loss is a pending order to stop and prevent further losses on open deals. A trailing stop loss trails the current market price by a predefined number of pips and works as a normal stop loss. A take profit is a pending order to take profits on open deals at a predefined price objective. Your exits are more important than your entries but this does not mean that you should enter the market at any price. Entries as well as exits should be optimized to maximize profits and minimize the risk of loss. Before trading with real money, you should practice opening, closing and modifying deals on a demo account. This will help you learn how all the Forex order types work in a simulated environment. In the process, you will also become better acquainted and more familiar with the trading platform. Trading is challenging enough as it is. The last thing you want is to make simple operational mistakes that can be easily avoided with some practice.